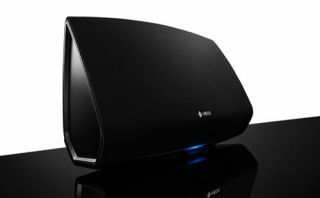 Denon launches HEOS wireless multi-room system | What Hi-Fi? Three wireless speakers and a wireless extender see Denon entering the multiroom market, claiming "great sound from all your favourite music sources"
Denon has joined the battle for the multi-room audio market with the launch of 'HEOS by Denon', a three-strong range of wireless speakers. The Denon HEOS 3, 5 (above) and 7 speakers are joined by the HEOS Extend, a wireless network extender. The speakers will be priced from "€299 to €599". Also in the pipeline are preamp and amp expansion products, allowing you to connect legacy products to your HEOS network. The HEOS range promises "Denon-quality audio", "state-of-the-art" smartphone control apps for Android and iOS and the ability to play "your favourite music from the world's leading online music services including top cloud sources, 'legacy' sources, and any smart device". The speakers will be able to play music stored on your smartphone or from a USB stick or NAS device. Denon claims "audiophile-level synchronization", DSP optimization in the form of MaxxAudio by Waves Audio and is making a big play, quite rightly, of its audio heritage. All the speakers connect to your existing Wi-Fi network, with Denon making the point that no Ethernet is required – Sonos currently requires the first Sonos speaker to be connected to your network via Ethernet, though this requirement is soon to be removed. And it is of course Sonos that Denon HEOS will have in its sights – and the HEOS range certainly bears plenty of similarities with Sonos. There are the same number of wireless speakers (three), and these are also known as Zone players on the Denon website, while, much like the Play:1, you can also use two of the entry-level HEOS 3 speakers together as a stereo pair. The HEOS 3 (above) has a two-channel digital amplifier, dual custom full-range drivers, can be placed horizontally or vertically and is also wall-mountable. There are aux and USB inputs, too. HEOS 5 (top) steps up in size and has four dedicated class D amplifiers, two custom-designed tweeters, midrange drivers and a passive radiator. There's a discrete handle on top and Denon claims "absolutely amazing bass" from a small footprint. The largest HEOS 7 speaker (above) has five amps and adds a metal trim to the design for a more premium look. There's also a headphone output, as well as aux and USB as on the other models. All three products are available in black and silver/white. The HEOS by Denon range of wireless multi-room products looks to be slated for release in August 2014. We'll be confirming UK prices and release dates, not to mention more details on music services, just as soon as we have them.